. إن الخدمات الممتازة وحسن الضيافة العالي في Silverton Apartments تجعل إقامتك تجربة لا تنسى. يمكن لضيوف الفندق الاستمتاع بالميزات التالية على أرض الفندق: تسجيل وصول/خروج سريع, تخزين الأمتعة, واي فاي في المناطق العامة, صف السيارات, غرفة عائلية . لقد جهزت هذه الإقامة الفندقية بعناية فائقة لتوفر مستوى عالي من الراحة. في بعض الغرف يجد النزيل اتصال لاسلكي بالإنترنت, غرف لغير المدخنين, مكيف هواء, تدفئة, مكتب. يقدم الفندق خدمات رائعة كمثل مركز للياقة البدنية, ساونا, مسار جولف - ضمن 3 كم, حمام سباحة خارجي, صيد السمك لمساعدتك على الاسترخاء بعد نهار طويل من النشاط والتجوال في المدينة. مهما كانت دواعي سفرك فإن Silverton Apartments هو خيار ممتاز لإقامتك في جولد كوست. يفتح كل من حمام السباحة والمنتجع الصحي والساونا ومركز اللياقة البدنية ومنطقة الشواء وغرفة الألعاب من الساعة 07:00 صباحًا وحتى 09:00 مساءً. يتعين على جميع النزلاء التوقيع على "شروط الإقامة" عند تسجيل الوصول. يُرجى العلم بأن كل الشقق مؤثثة بأثاث مستقل بها، والصور مُقدمة كمرجع فقط. تخضع جميع الطلبات الخاصة للتوافر، وقد يتم تطبيق رسوم إضافية. فيما يتعلق بشقق سيلفرتوون (Silverton Apartments)، يُرجى إعلام العقار مسبقًا بموعد وصولك المتوقع. بإمكان النزلاء ذكر هذا الأمر في مربع الطلبات الخاصة أثناء قيامهم بالحجز أو الاتصال بالعقار مباشرةً. يتعين دفع وديعة تأمين ببطاقة الائتمان بقيمة 200 دولار أسترالي عند تسجيل الوصول مقابل رسوم أو حدوث تلفيات خلال فترة الإقامة، وسيتم استردادها بالكامل بواسطة بطاقة الائتمان، ويخضع الأمر لتفتيش يجريه العقار. تخضع الغرف المكيَّفة للتوفر. إذا كنت تريد الإقامة في غرفة مكيّفة، فيُرجى ذكر هذا في قسم "الطلبات الخاصة" عند إجراء الحجز أو الاتصال بالعقار مباشرة. I never give bad reviews but the apartment was in a run down state. Furniture falling to pieces. Lights not working, glass wardrobrs looked as though they would fall out. Toilet makes loud noises & we could smell cigarettes in our room with the doors closed. The rest of the hotel/staff are fabulous. Our room on a previous stay was fantastic, I think we just got a lemon this time. Sorry for the bad review I never write bad reviews. Nice place to stay if you want to be on the doorstep to everything. onsite parking was a bonus so no need to worry about finding a place to park easy walking distance into surfers, apartment was nice and clean great view of the river from my balcony. Couldn’t really fault the place. Would stay here again. We enjoyed our stay at Silverton Apartments, however its in need of a urgent makeover. The positive is the location as its close to Northcliffe tram station. Management is very helpful & friendly. Pool surroundings are clean & nice. The apartment itself was disappointing. The bed was uncomfortable, no shower screens in both bathrooms, exposed wires from the ceiling with a sock to cover up one in the bedroom. Curtains had chocolate marks on them, coach collapsed in when you went to sit on it. The person who owns or rents this apartment needs to change the beds & couches and spend a bit of money to fix this apartment up. Our room was on the 13th floor room 72.
very nice lovely place for family. has kitchen equipped with oven, utensils, and so on, so you can basically cook and not eat out. would have been nicer if there were more restaurants around though. the hotel is just 5 minutes away from the surfers paradise beach so you can enjoy the sunrise view on the beach anytime. Our stay at Silverton was great! It was so centrally located (we rented a car), the longest car ride we took was approximately 20 mins. We had easy access to the weekend markets, theme parks, harbour town. We were there with a 15 months old toddler - apartment is not quite baby friendly with open access to kitchen and she was able to open and close cabinets and oven (which was quite dangerous), had to keep pulling her out of the kitchen. Toilet has no removable shower head so it was difficult to shower her too. Besides that, the entire apartment is carpeted so we didn't have to worry about her falling and hitting her head. Awesome view from our room with child friendly balcony! Apartment condition is a bit old but still in working condition, reasonably clean. Not the best but very acceptable considering price! 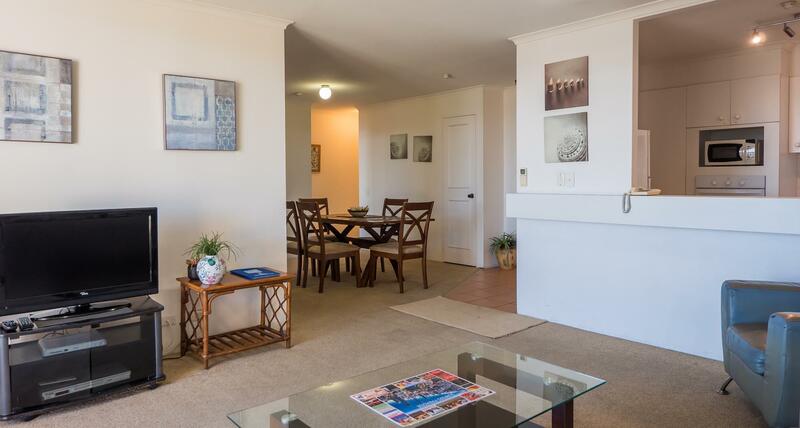 We really enjoy our trip to Gold Coast as the apartment that we stayed was very comfortable and convenient. We feel like our own home while staying there. Will surely stay there again during next trip. very thoughtful with the preparation of washing soap. and it is a convenient spot just right next to bus stop and not a long walk to surfers' paradise. also most of the facilities are in good conditions. the room rate was a real bargain.highly recommended for those who need a place to stay (on budget) while holiday-ing in Gold Coast as you wont be spending much time in the apartment.easy access to the bus stop that can pick you up to theme parks or any interesting places around gold coast.room is pretty dated yet cosy.we loved the kitchen, it got everything we could asked for.and river view room is a plus too! great stay. kitchenette is big with all the utensils ready. lounge is spacious though sofa is quite worn out. overall a comfy stay at 14th floor. owner angela is such a lovely lady. location wise, very near to surfers paradise it's only within 10minutes walk to the left after you exit from the apartment main entrance. there's a bus stop nearby which you can catch a bus (702 or 705, i forgot) to go directly to the airport. traveling in taxi is a lil expensive though. 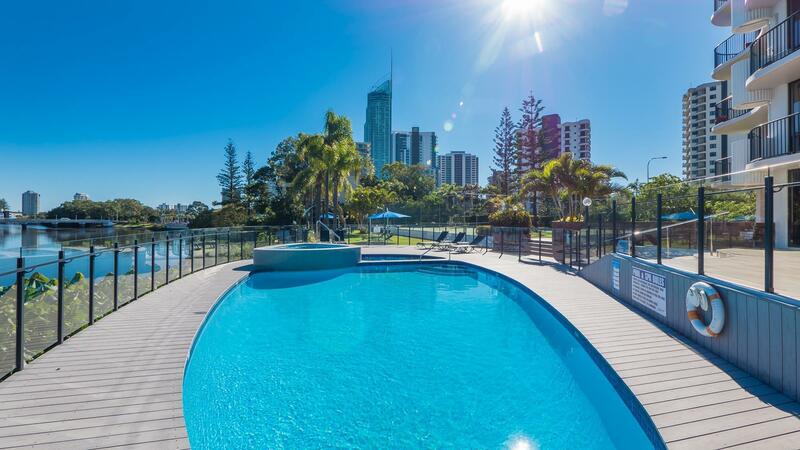 Silverton Apartments is located right in the heart of Surfer's Paradise, alongside the Gold Coast Highway. As a main thoroughfare for the Gold Coast, this can be noisy at night and early in the morning. The apartment itself contained 2 bedrooms (1 king bed and 2 single beds), with the main bedroom having an ensuite and a second bathroom available for use. The beds were comfortable, and the shower had hot water. The kitchen / dining / lounge room is quite large and has cooking facilities (toaster/kettle/oven/stovetop/microwave/fridge x 2) and a dishwasher (although this didn't do a very effective job). The dining room table had enough room for 5 people to sit around it and the lounge had a TV connected to Foxtel and a good amount of seating (although the couch was showing it's age). Overall the Apartment did the job, but was starting to show it's age. Stayed on the 15th floor. Apartment a tad tired but clean. Bed very comfortable and the shower was nice and hot. Sensational views north over the river. James is a very nice person and very pleasant and helpful. Will be back at Silverton when next at the Gold coast. Took a chance despite the bad reviews considering the cheap rate $120 p/n July '18 and it paid off. Four of us for eight days, the clean two bedroom apartment would easily sleep six with big wide sofas. Place now under new management i was told by host James. Top guy in sorting out room wi-fi for just additional $10 unlimited for the week. Massive glass walled north facing two b'room (unit 51 level 9), great 270° views of Surfers, from the adjoining river on the left right through to the south all along the wrap around balcony. Watching the busy activity down below of the intersection of the Gold Coast Hwy and Surfers Paradise Blvd or admiring the skyline of highrises with Q1 Skypoint central, not to mention the night view, brings to life Neil Diamond's song Beautiful Noise 'coming up from the streets . . .' - of course silence with the glass doors closed. Tram, bus station below. Will definitely request this same apartment for next trip to Gold Coast, picture perfect postcard view. Great pool and awesome view to the river. Room is basic but clean and fine for a few days. Our room was nice but had dents in some walls, tiles moving from the balcony door off the lounge room which could have been dangerous. There wasn't a drain grate in the master room bathroom wasnt safe with small children. The fridge would either over freeze or under freeze food and the light wouldn't always come on. The main bed wasn't really comfortable. The unit wasn't clean really well before our stay with small children. The location was great with the tram out front and the view of the river and mountains was very relaxing. It was fantastic and great value for money the location was great, bus stop out the front to take you to all the theam parks. Tram station just up the road and a 10 minute walk to Cavill Ave. We were on the 10th floor and the view of the Nerang river and Q1 building at night was beautiful. The appartment was clean and only a 5 minute walk to the beach. This is the second time we have stayed at the Silverton Apartments. They are in a great location with a great view out over the river and mountains.. The apartments are comfortable, clean an spacious and handy to beach and restaurants at Surfers Paradise. We would highly recommend this as a place to stay and hope to be back again. enjoyable nice and friendly staff. however they don't have Gym and other facility open for guest. although they don't have Gym facility in place. overall I have enjoyed my stay with family. I am waiting voucher from Agoda...!!! Was fantastic; will definitely be back next year. Room was a little tired but the building is being renovated. Had everything you need and the Staff were super. High recommend staying here Underground parking (free) a real bonus too. My stay was relaxing with great views from the balcony over the river and across to the hinterland. There were conveniently located shops close by that sold food and alcohol. The location is 10 minutes walk to the heart of Surfers.